97 doctors are warning of trouble. Maybe the next one will say its a hoax. This image was created with data acquired by the Atmospheric Infrared Sounder instrument (AIRS) on NASA's Aqua satellite during July 2009. 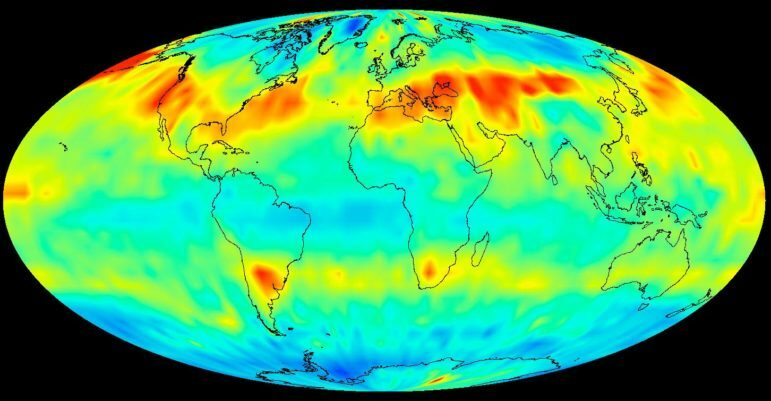 The image shows large-scale patterns of carbon dioxide concentrations that are transported around Earth by the general circulation of the atmosphere. Dark blue corresponds to a concentration of 382 parts per million and dark red corresponds to a concentration of almost 390 parts per million. I wake up and notice a slight bump on my hand – it has some red around it. I decide to ignore it for a few months because it seems silly to go to the doctor for a slight red bump. People ask me “What’s with the red bump?” I say “It’s nothing. It’ll go away.” But it doesn’t go away, in fact it gets a bit redder and a bit bigger. So I make an appointment to see the doctor just to be safe. Well, the doctor takes one look and says “That is definitely pre-cancerous” and needs to treated ASAP. He suggest a topical cream and I assure the doctor I’ll think about and go off on my merry way. After all it is pre-cancerous. Not real cancer! Right? Well, I ask some friends what they think and they recommend I get another opinion, so I make an appointment with another doctor. He takes one look and says “That is definitely pre-cancerous” and recommends the same topical treatment and once again I say I’ll think about it. The first Intergovernmental Panel on Climate Change report on climate change, 1990-92. Well dang if that red little bump on my hand has gotten bigger and redder and I’ve seen a total of 16 doctors now and all have said the same exact thing: pre-cancerous but treatable. I still haven’t decided on the cream. In fact the 16th doctor said it might need to be scrapped off first and then the cream but was still very treatable at this point. The second IPCC report on climate change, 1995. The red bump is no longer so little. It is bigger and actually affects the use of my hand and at this point I have seen 37 doctors and the 37th one said it was definitely skin cancer and needed to be removed immediately as it might spread and cause issues elsewhere. I take note but leave without making the appointment to remove it. The third IPCC report on climate change, 2001. Wow, my hand is pretty much useless and my elbow hurts to boot and I’ve now seen 57 doctors. Number 57 was sure I’d loose my hand but my vital organs show no signs of cancer. Did he say vital organs? The fourth IPCC report on climate change, 2007. Doctor 79 has confirmed that the cancer is now in full-on attack. Hand, arm, shoulder and neck are all cancerous and there is a high likelihood that it is untreatable at this point – but maybe, just maybe, if I act quickly and decisively I won’t die. The fifth IPCC report on climate change, 2014. How in the hell did I get to 97 doctors? I am feeling bad every day now – my life is a series of extremes – hot, cold, thirsty, sweaty, parched, shaky – completely unpredictable. The seventh IPCC report on climate change, 2019. The narrative stems from the well touted phrase that 97 percent of climate scientists believe that humans and their extreme use of carbon burning and the related deleterious effects of CO2 emissions have put us all (everything on the planet) on the path to a world we will not recognize — a world devoid of much of the known flora and fauna we take for granted, with heat indexes that are unsuitable for human life (and most other life). So we march forward in a virtual lockstep while we watch many coastal areas already experiencing high-tide flooding (think Miami, FL), parts of the Midwest are inundated by river flooding, bomb cyclones (bombogenesis) are common occurrences and these days Polar Vortex is common vernacular. I still have hope. I have heard that there is a doctor’s practice that has been touting that my type of cancer is not cancer at all and in fact is a fake prognosis. I think I’ll book an appointment soon — I sure hope the 98th opinion does the trick. Bill Freeman is a sustainable design and build expert located in Guilford, CT and owner of Celebration Green Design & Build. To read all IPCC reports see HERE.